The 2019 Yamaha FX Limited SVHO received some significant updates for 2019, including a new deck and an innovative touchscreen display. Yamaha has retooled its flagship FX platform for 2019, but also further refined their flagship craft, the 2019 Yamaha FX Limited SVHO. What’s new and improved? The list is long, so let’s cut right to the good stuff. At first glance, the most noticeable difference for the entire FX platform is a change in top deck. Gone is the large, triangular bow storage compartment and mirrors combo that previously dominated the craft and in its place is a more streamlined combo that keeps the front end still aggressive in look but far more streamlined overall. Those angles are still present in the bond rail, which now features angular trim pieces both forward and at the aft corners. Despite the streamlining, storage has actually increased within the bow compartment to 30.3 gallons from the previous craft’s 21.4-gallon capacity. On the Limited, that storage also now includes a removable soft-sided cooler bag in a designated spot. The glovebox of the 2019 Yamaha FX Limited SVHO has also grown significantly and now takes advantage of more of the space forward of the saddle. Capacity has grown from a mere 1.8 gallons to the current 4.65. The lid seal is now watertight. Yet another notable addition to the deck is a pair of footwell drains to keep water from puddling, not only when riding or sitting in the water, but also when the craft is stored outside on a rainy day. The information display is sure to catch attention. Yamaha scores an industry first with its 4.3” color touchscreen, a display that keeps tabs on the usual items like speed, RPM, trim and fuel levels but also adds numerous additional new features. For starters, the keyfob-style security remote has now been replaced by a four-digit code entered on the touchscreen. Users can also easily limit the craft’s top speed, set acceleration profiles for watersports towing, or call up the craft’s current fuel consumption. A choice of background colors is available to personalize the display, and brightness can be adjusted. My lone complaint is that even on the brightest setting the touchscreen appeared dimmer than I would have liked. 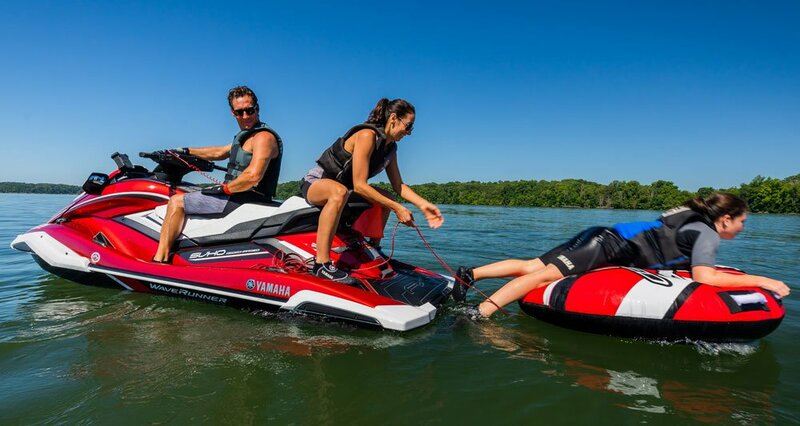 No Wake Mode gets an interesting tweak on the 2019 Yamaha FX Limited SVHO. Speed can now be bumped up or down several notches to match a strong current or keep pace with a fellow rider. Additional power can also be applied in reverse to back off the trailer at the launch ramp. For the ramp and other tight-confine situations like a marina, an “ultra low speed” mode can also be activated to really slow things down and give the driver plenty of time to react. Below, the new-and-improved deck is paired with a new-and-improved hull design. Yamaha notes it started with the GP1800 design, stretching it 10” and tweaking the surfaces to match the longer FX. Like the GP, turning is precision sharp, but with a little more of an intuitive inside lean to take some of the strain off the upper body. A top-loader scoop grate more effectively loads the pump and keeps the stern anchored to the water. 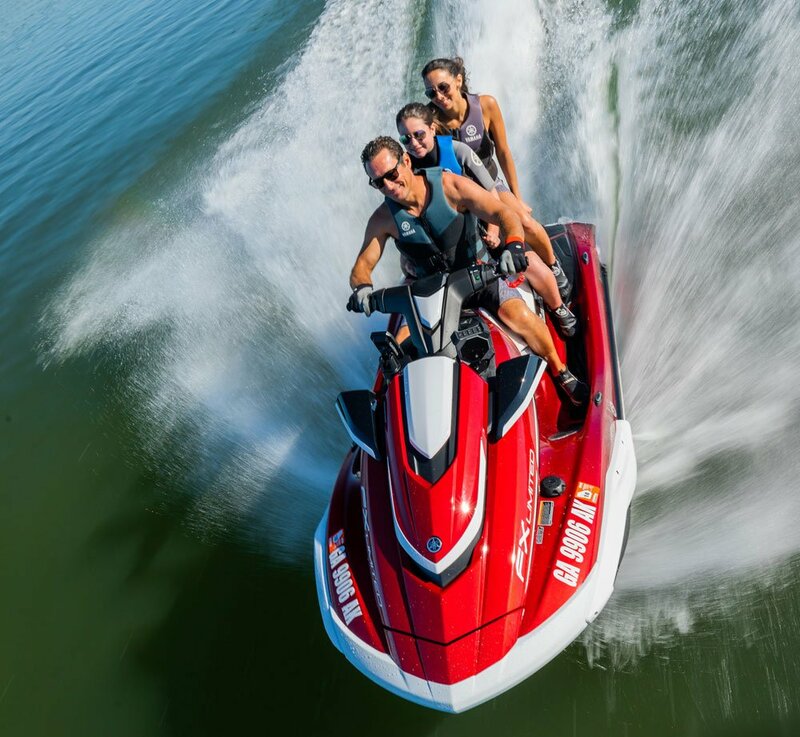 It’s a performance-oriented ride for those that want to push the limits, while retaining all of Yamaha’s classic rough-water prowess when it comes time to blast out into open water. Power for the 2019 Yamaha FX Limited SVHO continues to be supplied by Yamaha’s 1,812cc mill that combines both supercharger and intercooler to produce rocket-like acceleration out of the hole. Given that hull and deck are made from Yamaha’s lightest NanoXcel 2 material, power-to-weight ratio is maximized. Top speed peaked at a familiar 67 mph, although certain combinations of weight, conditions and rider skill occasionally produced more. Last but not least? The boarding step is further improved, with a broad, flat step that extends deeper into the water and neatly tucks into the bond rail design when not in use. 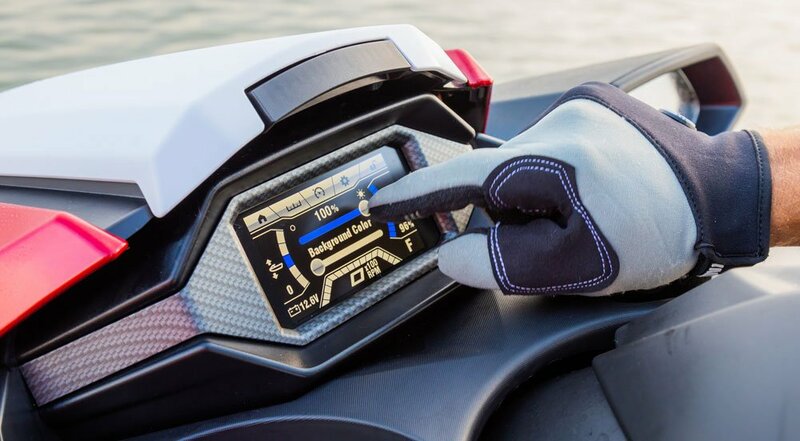 As to extras on the 2019 Yamaha FX Limited SVHO, the RiDE dual throttle system is still in use, enabling intuitive control over the boat in forward, neutral and reverse and providing stopping power at speed. Cruise control is also still present, as are the “limited” package goodies like single-passenger inflatable, 12-volt inflator and outlet, towrope, tube holder, dry bags, fenders, pull-up cleats and custom colors with matching cover. The coolest extras for ’19, however, are arguably a combination of new accessories. Yamaha designers have turned to industry-standard RAM mounts to add a number of items to the FX and personalize it to how a rider uses their craft. The mounts take the place of the forward cupholders. On the Limited, they’re used to hold an included set of EcoXGear Bluetooth speakers, Garmin GPS Fishfinder with thru-hull transducer or beverage holder. Mounts can just as easily hold a GoPro-style action camera or any number of aftermarket accessories. When not interested, just take the items off. RAM Mounts are simple and quick. 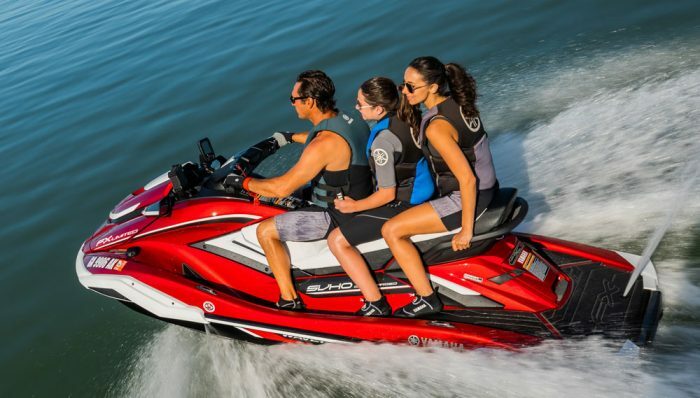 As before, the 2019 Yamaha FX Limited SVHO’s most competitive model remains Sea-Doo’s GTX Limited 300 ($17,099). The GTX is similar in size and power, and also features a collection of “limited” additions, including dry bag, safety kit, cover and storage bin organizer. 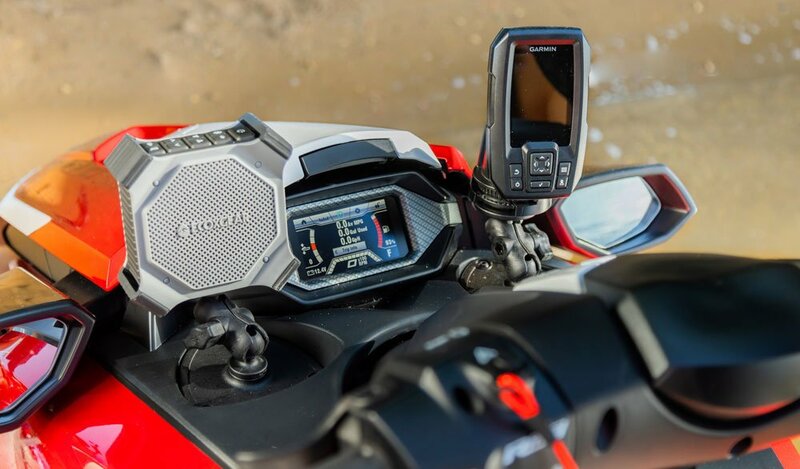 The GTX Limited also includes a permanently mounted Bluetooth audio system, modular saddle and platform accessory mounts for items like spare fuel tank or cooler.